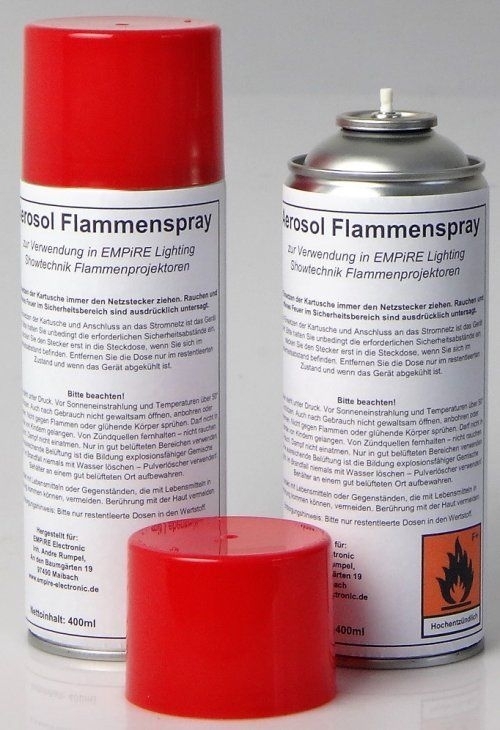 The flame spray has been specially optimized for the use of fire projectors and produces smokeless and residue-free combustion of the gas mixture. The aerosol is ignited via an igniter in the respective flame projector. With a can of flame sparks, over 150 flame balls, or over 90-120 mixed streaks of flame can be generated. Der Flammenspray wurde speziell für den Einsatz von Feuerprojektoren optimiert und erzeugt eine rauchlose und rückstandsfreie Verbrennung des Gasgemischs. Gezündet wird das Aerosol über einen Zünder im jeweiligen Flammenprojektor.